Flint & Flame are thrilled with the feedback, reviews and testimonials that we get from our customers. Their passion, enthusiasm and amazing stories keep us buzzing at shows and events all over the country, as they approach and tell us how much they love their knives, kitchenware and salt slabs. 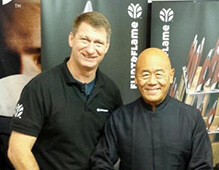 Click here to hear from the long list of top Chefs who use and love Flint & Flame knives. They are an amazing, inspiring and fun bunch of people to work with – we’re proud to count them as friends. Click here to hear from our amazing customers – people who love to cook, who understand what a difference great knives and kitchenware can make and who are such great fun to talk to. If you have a story to share we’d love to hear from you, please email us – we read every email and letter.